Sometimes when a person considers finding ways to start paying off debt, the journey they’re facing seems too overwhelming to even begin. However, the journey of 1,000 miles begins with a single step. By taking that one simple step you begin to build confidence to continue, and before you know it you have serious momentum. It’s easy to delay attacking debt because you feel like you have so much to do that you don’t know what to do first – much less have confidence that you’ll be successful. Below are 25 ways you can start paying off debt today and achieve financial freedom. Each of the below opportunities may not work for you, or provide a smaller return. Don’t let that stop you. Find five or six of the below ways to pay off debt and use them to your advantage. Before you know it you will build the momentum needed to kill your debt for good. 1. Sell something. Most of us have houses, garages, and storage areas filled with things we were sure we’d love forever, but haven’t looked at in months or years. Using a discerning eye, look through your stuff and see what you can sell that would gain you some cash to put toward debt. Use a Facebook club, send email to family and friends, post on Craigslist or use a site like Gazelle to sell old electronics and other items you no longer use. Take the earnings and throw it at your debt. This can be a great one-time way to pay extra towards your debt. 2. Start a change jar. Set a jar on your dresser to collect all of your loose coins at the end of the day. You’ll be amazed at how quickly you’ll have accumulated a decent amount of money to put toward debt. To give your goal extra “oomph”, put $1 or $5 bills in the jar to accelerate your paying off debt efforts. To help break the cycle of debt you can open a savings account so you have that to fall on in an emergency. Barclays pays 2.20 percent, with no minimum balance (that’s more than 22X the national average) and is a great option to start down the path of financial stability. 3. Consolidate your debt. The less money you pay in interest each month, the more money you’ll be putting toward debt balances each month. You can do this by taking out an unsecured personal loan to achieve significantly lower rates and have only one bill to deal with each month. Some providers, like Lightstream allow you to cut rates by half, or more, allowing you to save significant money on interest payments. Avant is another good option, if you have average to bad credit (a score of at least 580) and allows you to get funds within one business day. You can also compare lenders to find the best rate and fit possible. Even Financial lets you compare up to 17 lenders to find the best personal loan for your needs. It takes less than a minute to fill out the application, and within a few minutes they provide possible matches. 4. Get a side hustle. Pick up a second job delivering pizzas or doing something else that works with your schedule. Or start your own side hustle. You may think you don’t have the talent to start a side hustle. Don’t give into that lie! There are many opportunities available, you just have to be willing to try them. You can even make money while watching TV by taking short surveys. Survey Junkie: This is our favorite survey site since they pay you cash straight to PayPal, and you can redeem once you hit $10. Pinecone Research: This site pays $3 per survey and you can choose between PayPal, Amazon or restaurant gift cards for your payment. They also pay to do product testing. Ipsos i-Say: Ipsos is one of the oldest survey sites in the market, starting in 1975. Ipsos has a wide variety of survey and product testing opportunities, with a low redemption threshold of only $5, or 500 points. The platform also enters you into free drawings (one entry per survey) for extra cash. Global Test Market: Global TestMarket lets you make money for answering surveys, testing products, and also asks for feedback on products you already use around your home. Global TestMarket has paid out over $30 million in earnings since 2016, and you can redeem earnings as cash to PayPal or as gift cards. Inbox Dollars: Earn money for taking surveys, watching TV, or making purchases online. Get $5 just for signing up. 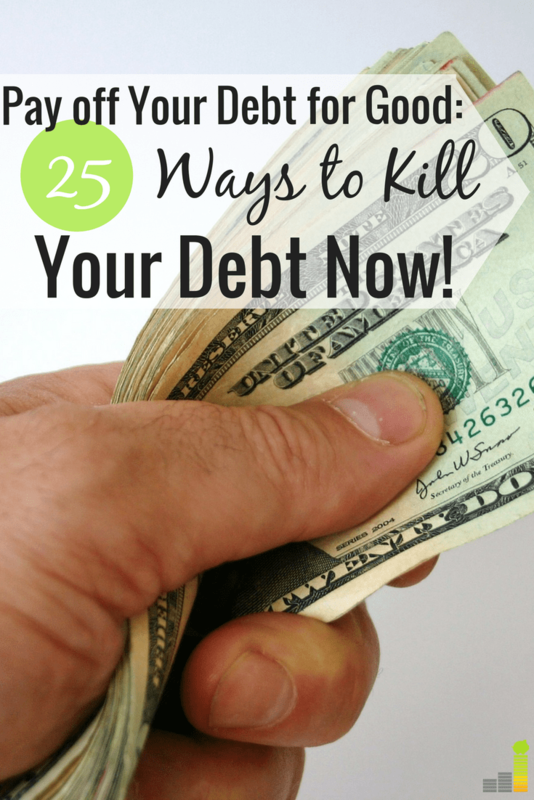 Here are 24 ways to earn extra money to pay off debt to give you some ideas to start. Think outside the box and devote your earnings to killing your debt. 5. Re-work your budget. Or get a budget if you don’t already have one. Look at your budget line-by-line and consider dropping anything that isn’t a necessity. If you don’t know how to make a budget, it’s not as difficult as it seems. 6. Lower or eliminate your TV bill. Drop the spendy satellite package and pick one of the best TV streaming services to slash your bill. Or trade it in altogether for Netflix or an Amazon Fire TV Stick. Check out the Amazon Fire TV channels list to see what kind of content you can expect with the device. 7. Cancel unused subscriptions. There’s no sense to have a lot of memberships or subscriptions when paying off debt. You can use Trim, a free tool that analyzes all subscriptions and memberships to find ones you don’t use, cancels them and you bank the savings. Trim can even negotiate bills for you to save more money. 8. Transfer your credit card balance to a 0% APR card. Like #3 above, using a balance transfer credit card can be a great way to start killing your debt. Most balance transfer cards offer a period of 0% interest for 12 – 18 months. Find one that works for you and keep your payments the same to slash your debt. Click here to find such cards to help you pay off debt faster. 9. Get a cheaper cell phone plan. Plans at Republic Wireless start as low as $15 per month, Find a plan that works for you and throw the savings at your debt. 10. Shop around for lower insurance rates. Do some comparison shopping on car and homeowners insurance rates. You may be surprised at how much you can save and put towards debt. Studies show nearly 40 percent of drivers, for example, have not compared rates in over three years. If you’re a part of that group you could be overlooking savings. Esurance is one great option. The average driver saves over $350 per year when they switch. That’s money you can put directly towards your debt! 11. Start using the envelope system. There’s something about paying in cash that makes the reality of how hard you worked for your money set in. Use this to your advantage to help you cut spending. 12. Reduce housing costs by downsizing, or getting a roommate or renter. Consider selling your house for a less expensive one, refinancing your mortgage if the rate is high or getting a roommate or renter. If you currently rent, look for cheaper housing. If you own, compare rates at LendingTree to find the lowest rate possible. 13. Learn how to grocery shop wisely. Make a menu plan and shop in a way that will help you save money on groceries. If you don’t know where to start with menu planning, check out $5 Meal Plan. They provide you with sample meal plans with tasty recipes that will help you save at the grocery store. 14. Reduce transportation costs. See if there’s a way you can bike or walk to work, carpool or use public transportation in order to save on auto expenses. 15. Bring a bag lunch to work. Find some great recipes online and start bringing your lunch to work. 16. Check into an off-peak energy usage plan. Many energy companies offer big discounts for those who choose to use the majority of their energy during set off-peak hours. Contact your energy company and see if their off-peak plan fits your lifestyle. Buy a programmable thermostat, here are the best ones on Amazon, to help regulate your energy usage as it’s one of the best ways to save money each month. 17. Sell your car and get a cheaper, reliable one. Do you have an average car payment – like $500 average? Get rid of that big car payment and buy an older, reliable car. 18. Reduce food costs by cutting out the junk food purchases. Stop buying the chips and other processed food that can take a huge chunk out of your grocery budget. Start researching healthier, more frugal snack and meal options. 19. Learn to do appearance maintenance stuff like manicures, pedicures and haircuts at home. You can save hundreds of dollars a year by skipping the salon and learning to do appearance maintenance at home. 20. Stop eating out and picking up takeout. Have a great menu plan in place so you’re not tempted to stop and eat out. If time is a factor, spend Sundays making and freezing meals to use throughout the week. 21. Commit to putting all extra/unexpected money toward debt. Any tax refunds, overtime pay, bonuses or other money that you didn’t expect to have goes directly toward debt. 22. Trade in costly entertainment choices for free ones. Skip the movie theater and have a movie night with air-popped popcorn at home. You can even use the best places to watch free movies online and not pay a dime. Trade in the professional sports games for a nice hike in the woods. Make a list of free entertainment to keep yourself busy at little or no cost. 23. Learn to do home repair/maintenance items yourself. Use online resources to avoid having to pay a repair or maintenance company when possible and fix things yourself instead. These are skills that, once learned, you can use to make money too. 24. Lower alcohol or soda expenses by drinking water instead. Alcohol and soda purchases drain a budget fast. Work to cut down on consumption of these expensive items and drink more water. 25. Stop buying coffee shop coffee and make it at home. My husband drinks at least two cups of coffee a day, nearly ever day, but it only costs us about $20 a month. How? We save money on coffee by purchasing bulk coffee beans, grinding them at home, and adding in a store-bought creamer for that sweet touch. You can become debt free this year! Many want to pay off debt, but think it’s impossible. Please don’t give into that lie. 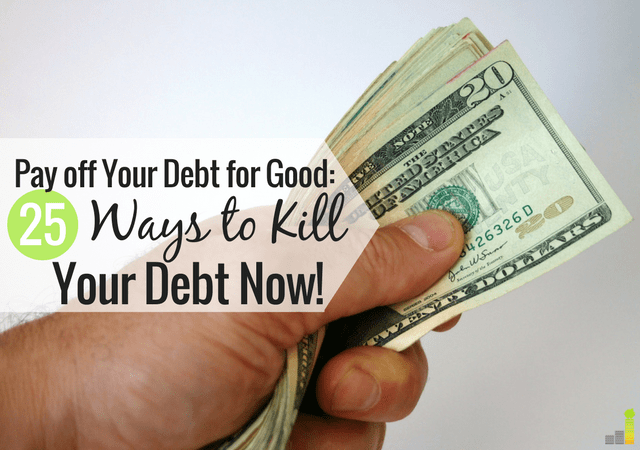 With some sacrifice and work it is possible to pay off debt for good this year. Look for savings opportunities and earn extra income to truly make progress. You may be tempted to give up along the way. That’s a natural feeling. However, when you keep your eye on the goal and commit to your plan debt freedom is possible. Additional resource: If you’re looking for a simple way to track your spending to identify extra money to pay off debt, then check out my favorite tool – Personal Capital. Completely free, it allows you to track your spending, monitor your bank and investment accounts and watch your net worth grow plus many other tools. What tools do you use to pay off debt faster? What would be the first thing you’ll do when you’re debt free? How are you going to achieve debt freedom this year? This is perfect advice, Laurie! And I think it works for anyone who wants to pay down debt or ramp up their savings. I think it’s really telling that so many of these tips are about reducing food expenses–and I totally agree. Food costs will eat you alive if you’re not careful! We do many of these things, but you’re reminding me that I should get on the ball about selling off stuff we don’t need… Craigslist to the rescue! “Food costs will eat you alive…” Well said, Mrs. FW! I know for us we used to spend double on food what we spend now. OUCH! Agreed, thanks for the great tips. I see so many people pay $500-600 for groceries alone and they don’t even have kids! It can really get out of hand if one doesn’t shop around and stay frugal. All great tips Laurie! It’s all about changing your behavior and sticking with it. If you can accept change you can be successful in any of the ideas you presented. So true, Brian! Accepting responsibility and being willing to change is 90% of the battle. You’ve created a great list here, Laurie. All of your ideas can be turned into new habits. Once these new habits are established, the old ways of doing things are no longer missed (and you have created a positive new wealth-creating habit at the same time). This is one important aspect of the frugal mindset. Thanks for your hard work. I have been making my own pizza at home instead of ordering takeout for a while. I have found a way for even homemade pizza to be convenient–simply freeze it pre-baked! I plan to make several of these to keep on hand. I made my dough, rolled it out onto my pizza pan and prepared as usual with sauce and cheese. I then froze it RIGHT ON THE PAN. When it was frozen, I wrapped it in foil and labeled it. When I want to serve it, I unwrap, put it back on a pizza pan and bake as usual. It only takes a few more minutes to bake than fresh, and it is simple enough for my teens to do it themselves. I have been planning to do some of your other tips you listed, and have already done some (such as an interest free balance transfer for 15 months, saving me about $150 per month–yikes.) Great list! Love this, Jodi! We make our own pizzas too. Not only are they cheaper, they’re healthier! It’s a great way to save money but still have a great pizza on occasion. Great tips, Laurie! It’s funny how hard it is to find ways to cut back on other things to pay down debt..but it’s always right in front of our faces. I sell things to help me pay off my debt. I really don’t know what I’m going to do once I debt free. I might shed tears of joy. Make sure you actually save any savings. For example, we pay $92 less a month by using Hulu. I put that into an account each month to be sure it doesn’t vanish into the ether of everyday spending. I actually have a whole Saved Savings account. When I use a coupon or hit a sale, I try to put the difference in the account. I also put aside any money I save by using gift cards from rewards programs. That’s a smart technique, Abigail. With us, whenever we come across extra money, it goes straight to a debt payment before, as you mentioned, it gets lost in the abyss of daily spending. We have done a number of these things. Our biggest money savers/makers last year were controlling our food budget, working side hustles and canceling cable. The great thing is that we have kept up with all of these this year so our benefits continue to increase with time. Great tips Laurie! Using more than one of them is the best way to make quick progress toward getting out of debt. Entertainment/eating out budget is still my weakest point. Yeah, it used to be for us too: I get it. Funny thing is though, the urge to dine out has diminished over time. I have it set up through my bank that every time I use my debit card $2 goes into my savings. You don’t notice…then when it gets to a certain amount I put it on my credit card. They (TD) will set up any amount. Never underestimate the power of a change jar! My change jar is in fact a paint can and Lewis and I have been saving change in our “bank” since he started law school and we vowed not the take from it until out big anniversary/graduation trip this year. Just 7.5 more months to go! I can’t wait to see what we’ve added up over the years! TIP: Also, the key to a good self-manicure isn’t exactly a steady hand. You should also have a very think polish and wide brush. I haven’t had a manicure since my wedding (2011) because I discovered Sally Hansens quick dry polish. I find myself spending too much money on food and dining out. Occasionally we have no dining out months and we need to do them a lot more during this summer. Summer is when I’m able to get my food budget relatively low because I stick with simple easy prep foods like salads because most veggies are in season and cheaper. We’re also able to grill cheaper foods like chicken etc. We could definitely start a change jar and I’m going to look into the energy information with our power company. Our energy bill has been ridiculous this winter. Debt is a serious problem in today’s society! All of your ideas were great ways to jump start paying off your debt! Thanks for sharing with us! I have looked into some of the consolidation companies but I am concerned that they want me to not pay the credit cards for 60-180 days so they can negotiate on my behalf but in the mean time I pay them a set amount. I feel this will damage my credit more severely. What do you think? Hi Erika, I’d be concerned going that route as I’d be afraid it’d damage my credit. Have you looked at possibly taking out a personal loan to consolidate them into one by chance? If not, it may be an option and would cut down the time to 1-2 weeks if you get approved. I like all these ideas. However, my husband complains all the time about the cost of my wifi, however, he will not even think about doing without his Dish and he gets the highest plan they have. This is not the only thing we disagree on. It makes things difficult to save money. Being very different makes it hard to save money. I really need to put some of these idea and more into place and save money so I can get out of debt. Sorry to hear that LaNita, I can imagine that’d be a challenge. I can’t speak to everything, but you could suggest your husband take a look at DirecTV Now or Sling TV as options to still get TV without a high cost contract. I’ve put my reviews of each below for you to take a look at.